Have you ever wondered what happens to empty wood pallets that we see accumulating outside of warehouses or in the alley behind small businesses? Although many people believe that these pallets mostly go to landfills, this has not been the case now for the last several years. With the emergence of an efficient pallet recycling industry in recent decades, more old wood pallets are being recovered for repair and reuse or finally for transformation into wood fiber products such as landscaping mulch or fuel. The increasing popularity of using pallets for craft projects is also providing an outlet for a small but increasingly notable proportion of them. 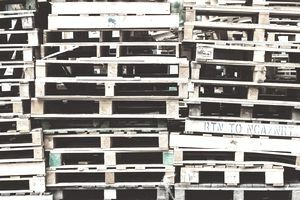 If one thing is sure, pallets most likely to be recycled are ones of the most popular sizes, such as 48x40-inch or other conventional pallet footprints in North America, or 800x1200mm or 1200x1000mm in Europe. Also of note, pallet recovery is most likely in locations where there are greater accumulations. The value proposition for pallet recyclers is, of course, more attractive where there are larger quantities of the more valuable popular sizes. Following this train of thought, pallets are less likely to be recovered where there are fewer generated and of less popular sizes. At building job sites, for example, pallet recovery has been slower to evolve, but even for these situations, pallet recycling is becoming increasingly popular in conjunction with increasing emphasis on sustainable construction practices. Even where only small amounts of empty pallets are found, pallet collectors, operating with small truck or trailer, often collect them for resale. The pallet recycling industry has become very efficient in diverting pallets away from landfills. In 1992, only 51 million pallets were recovered. By 1995, however, that number had shot up to 143 million. By 1999, that number had reached 223 million, and by 2006, the total amount of pallets recovered was around 357 million units. In 2011, 474 million pallets were recovered. Regarding pallet recovery by region, the South led the way with 204 million pallet cores, another term for recovered pallets, recovered in 2011, followed by the Midwest with 148 million. In the West, 74 million pallet cores were recovered, and 61 million in the Northeast. What Happens to Recovered Pallets? According to U.S. Forest Service figures, around 68.5 percent of recovered pallets are repaired for reuse, with another 11.9 percent reusable without repair. Another 16.2 percent are dismantled to be used as replacement lumber or in the construction of new pallets using recycled lumber, or a combination of new and recycled lumber. Another 3.1 percent are chipped or ground, for a variety of applications, and 0.3 percent end up being used for "other" purposes. Regarding those 3.1 percent of recovered pallets that are ground or chipped, around 44 percent is used for colored landscaping mulch, 11 percent for uncolored landscaping mulch, and 10 percent for animal bedding. Another 30 percent is used for waste to energy products such as boiler fuel or wood pellets, and the final 6 percent goes to unidentified other purposes. Based on current trends in logistics towards reusable pallet systems as well as for more efficient pallet recycling, it can be anticipated that pallet recovery will continue to improve.